Three thought-provoking KM-related articles have recently come to my attention, so I thought it might be useful to bring them together. Two of them embody a critical approach to the discipline, whilst the third is more mainstream (but can be read in a different way). Those who participate in the actKM mailing list will know that Joe Firestone has strongly-held and coherent views about the definition of knowledge management. He argues passionately that there should be a definition and that the definition should be based on the philosophy of Karl Popper. I have found that Joe’s writing has become clearer the more I read of it. I am not sure if this is because I understand his ideas better or because his expression of those ideas has improved. If it is the latter (which is admittedly less likely), then I highly recommend his latest article, “On doing knowledge management” in the current issue of the journal Knowledge Management Research & Practice. It is available to download for a limited time. people can be doing non-KM and calling it non-KM. These possibilities exist from whatever point of view KM is defined. The first and fourth represent no problem if one wants to evaluate KM, but clearly, without agreement on what KM is, the second and third introduce serious problems in any evaluation of KM’s impact or effectiveness. And the more frequently these possibilities occur, the greater the error introduced into KM’s track record, regardless of the truth of impact models developed to assess the impact of instances of the first possibility. How frequently do the second and third possibilities occur? Clearly, the more there is disagreement about what KM is, the more second and third possibilities exist, and the more any track record evaluating KM, either formal or informal, will be distorted and misleading in telling us what percentage of KM efforts are successes. 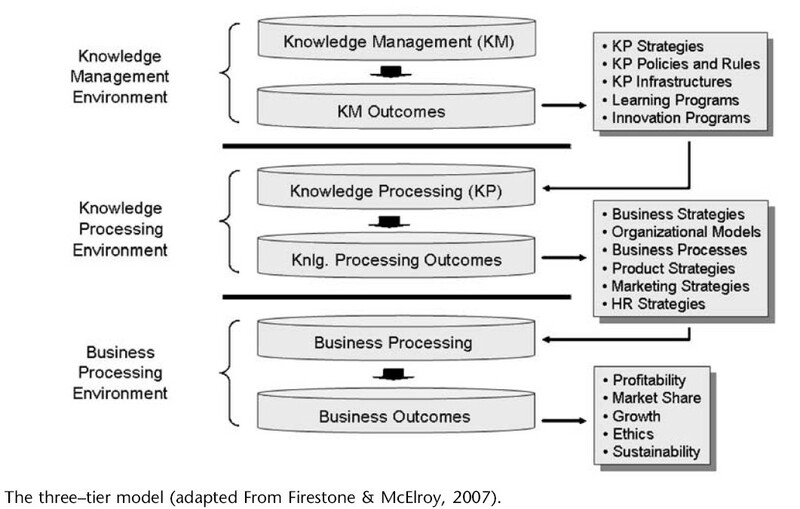 The article goes on to define and give examples of two different approaches to knowledge management. Joe argues that all KM interventions can be classified into these two types. Once we understand this, he claims, it is easier to determine which interventions are successful and which are not. I am still grappling with this aspect of his work, but I have found the three-tier model very useful in explaining to my colleagues (in the KM team and elsewhere) exactly what it is that we do (and, just as importantly, what everyone’s responsibilities are). When one uses abstract concepts without giving examples or stories to illustrate what one means, people will impose their own understanding of the concepts and so misunderstandings can arise. We deal on a daily basis with abstract (and contested) nouns like “knowledge”, “learning”, “information” and “development”, so what we do is always open to misunderstanding. One way in which people manage abstract concepts is to liken them to other things — either physical objects or other abstractions that are more familiar and easier to comprehend. The choices they make at the outset will determine some of the conclusions that they come to. Andriessen’s article outlines a small piece of research into the use of different metaphors for knowledge, and the impact those metaphors have on people’s views of valuable knowledge activities. In the research, a group was asked to think of knowledge as water, and then as love. Using each of the metaphors, they were guided through a set of exercises designed to extract their views on what their organisation should do about knowledge. The end result was striking. I asked the participants to identify a number of problems related to KM in their organisation and think of a number of solutions. However, I asked them to do this using a particular metaphor for knowledge. First I asked them to do this using the KNOWLEDGE AS WATER metaphor. This resulted in a number of problems and solutions…. [M]ost of these are in line with [a] mechanistic approach to KM…. Then I asked them to do the same, but this time using a metaphor that is much more in line with an Eastern view of knowledge. I asked them to discuss problems and solutions regarding knowledge while thinking of KNOWLEDGE AS LOVE. What happened was quite remarkable. The topic of conversations changed completely. Suddenly their conversations were about relationships within the organisation, trust, passion in work, the gap between their tasks and their personal aspirations, etc. I’ve frequently written about legal KM morphing into practice support. As I read this article, it suggests that corporate KM is being absorbed by the building blocks of other functions. Sounds like a similar theme to me, only one that is not articulated. This is an interesting theme, and I hope to be able to dwell on it at some point in the future, perhaps building on some of the insights in the other two articles. I just ran across your blog and wanted to thank you for your discussion of my KMRP and discussion in light of Dan Andriessen and Tom Davenport and Larry Prusak’s pieces. It’s most interesting to see these three artiicles reviewed in the same context. I’ll subscribe to your RSS and add you to my blog roll.